Lake Tahoe is often referred to as the perfect year round vacation with terrific weather and breathtaking scenery! Split down the middle by the California and Nevada border, Lake Tahoe boasts of over 300 days of warm sunshine, incredible hiking & biking trails, camping, beaches, and the beautiful blue Lake Tahoe itself! Surrounded by mountains, the present day lake sits in a valley at an elevation of 6,229 feet. It is the highest lake of its size in the United States. It is the third deepest lake in North America and the tenth deepest lake in the world. This blue lake is so clear that in some places objects can be seen to depths of 75 feet! Whether you’re looking to spend your days summiting majestic peaks for that ultimate Lake Tahoe view, or sifting sand between your toes at one of our many beaches for ultimate relaxation, we guarantee this is the vacation you’re looking for. So if you are ready to rough it, join us for a camping adventure to Lake Tahoe over the 4th of July weekend. Just kick back and enjoy the ride in a first class luxury bus. On top of that, we are going to be serving up some good old-fashioned home cooking. There will be plenty of hiking and relaxation. We have reserved a group campsite at the D.L. Bliss State Park Campground, which is located on the west coast of Lake Tahoe. It has flush toilets, fire ring, sinks in restroom, showers, drinking water, and picnic tables. If you never have been to Lake Tahoe or camp before, we highly encourage you to attend. The only gear you need that you might not have is a tent (you can share or rent one) and a sleeping bag. It is going to be a fun, social, and amazing trip you will never forget! We plan to leave in the late evening and drive through the night. There will be one bus pickup point at the Van Nuys Flyaway. 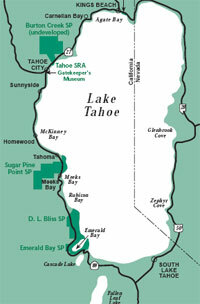 Lake Tahoe is about a 9 hour drive from Los Angeles. Summer temperatures range from about 75 degrees during the day to the low 40s. We will camp all 3 nights at the D.L. Bliss State Park Campground. D.L. Bliss State Park Campground borders Emerald Bay State Park to the north. The area needs no description, it’s all in the name. With roughly a mile and a half of sandy beach and turquoise water it really is bliss just to look at the area. On one end is a roped off swimming area and on the other is the Rubicon Point, a huge outcropping of solid granite and boulders that juts out into the lake above 25-foot-deep sandy bottom crystalline water. D.L. Bliss is also home to some 165 camping spots and miles of hiking trails. With some of the most beautiful water on the lake, as well as some of the best shoreline terrain, D.L. Bliss is a perfect place to be entertained for an entire day. Calawee Cove, just inside of Rubicon Point, is also perfect water for anchoring a boat and one of the more popular anchor stops on the lake. Balancing Rock Nature Trail - The Balancing Rock, "tons of granite resting precariously on a slender stone base", has long been a natural attraction on Lake Tahoe's western shore. Visitors to the Lake Tahoe area in the late 1800's and early 1900's enjoyed being photographed next to this geological marvel. Today, the Balancing Rock is the feature attraction of a short, half mile self-guided nature trail in the northwest section of D.L. Bliss State Park. The granite of this large rock began weathering more rapidly at the joint plane, an extensive horizontal crack that is easily seen at its "waist". The overlying rock weighs around 130 tons and is now balanced on the rock below. This precarious remnant of granitic rock will eventually fall when enough material has eroded away to break the equilibrium between the two pedestals. Visitors can pick up a brochure at the start of the trail. Along the path, there are 19 numbered markers where you can stop and learn more about the interrelationships between the soils, plants, and animals found in the park. Lester Beach and Calawee Cove Beach – These two beaches are considered one of the most beautiful beaches in Tahoe. Located about ½ mile from our campsite, you can spend the rest of the afternoon sunbathing, swimming, snorkeling or just relaxing. Get acclimated to the elevation and recharge your batteries because the next two days will be filled with various activities. For those who would like to explore more of the park, you can combine the Rubicon Trail with the Lighthouse Trail to form a two-mile loop, complete with incredible lake views and a bit of history at the old Rubicon Point Lighthouse. On this day, we will split into two groups for a combination of hiking and kayaking activity. One group will hike from the campground to Emerald Bay, then kayak to Fannette Island and finally ending at Baldwin Beach. The other group will be shuttled to Baldwin Beach, kayak to Fannette Island, and then hike from Emerald Bay back to the campground. The two groups will rendezvous at Vikingsholm in Emerald Bay and switch activity. In the 1880s, a Sacramento newsman compared Lake Tahoe's sapphire depths to bluing solution, so astonishing was the color. Mark Twain (Samuel Clemens) said Lake Tahoe's air was pure enough for angels. Clear sky and water still startle the senses here, especially when you spend the day close to shore on the 6 1/2-mile Rubicon Trail. The footpath connects rocky points and sandy coves along an untamed shoreline that once intimidated mountain men. Today, the paths have been cleared and the steeper sections shored up. The most popular trailheads are at D.L. Bliss State Park and Emerald Bay State Park. It's 4 1/2 miles between those points; also, you can take the new 2-mile extension past Vikingsholm. The Bliss trailhead approach is particularly lovely. Its crushed-granite path leads, after about 1/8 mile, to Rubicon Point, where the trail turns south. About 1/5 mile past Rubicon Point, you'll reach a place where dramatic granite cliffs descend 600 feet to a watery mosaic of blues – they continue another 1,400 feet below water. A few steps around the corner is a strange crowd of natural rock figures. Use your imagination to identify local favorites such as Frog Rock, Sleeping Lady, Gladiator, and Old King Cole. Across a ravine behind the formations is an osprey nest that's been there for years. A separate trail departs here for the remains of a small wood lighthouse. About 1/2 mile farther south, the trail leaves sunny terrain for cooler slopes shaded by sugar and Jeffrey pines, Douglas fir, and incense cedar trees. You'll pass another rocky view point before switch backing downhill to the sandy coves of Emerald Point. Views encompass glacier-carved mountain peaks and the lumpy profile of Fannette Island – legends of ghosts and turn-of-the-century tea parties here enthrall visitors. Continuing around the bay, you'll come to Vikingsholm, a 38-room mansion built in 1929 for a woman who wanted to replicate the stonework, turrets, and sod roofing of medieval Scandinavian architecture. Save time for a 30-minute guided tour (optional) – they're available between 10 and 4 every half hour daily through the end of September. After eating lunch, you’ll pair up and kayak to Fannette Island, which is the only island to be found in all of Lake Tahoe. The stone structure on top that looks like a miniature castle is the "Tea House" built during the same time that Vikingsholm was constructed, from 1928-29. After being transported to the island by motorboat, Mrs. Knight and her guests would occasionally be served tea there. A small fireplace in the corner and a large oak table and four oak chairs in the center of the 16 by 16 foot room gave it a very rustic appearance. Feel free to dock your kayak and explore the Tea House. Your kayaking trek ends at Baldwin Beach where you’ll board the bus and return to the campground. After cleaning up, we'll head into South Lake Tahoe. Dinner will be on your own. 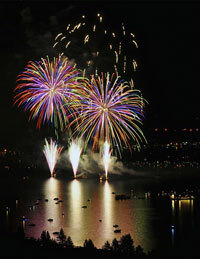 You'll get to enjoy the Star Spangled Fourth - Lights on the Lake fireworks show. Launched from an offshore barge, the pyrotechnic fireworks display is one of the largest west of the Mississippi and is synchronized to music broadcasted over local radio. More than 100,000 people watch the South Shore fireworks annually. Squaw Valley USA – Squaw Valley's world renowned cable car carries you up 2000' vertical feet to the High Camp Bath and Tennis Club. The Cable Car features ultra-modern cabins, interior seating, and floor-to-ceiling panoramic windows offering expansive views of the beautiful Sierra Nevada and Lake Tahoe. 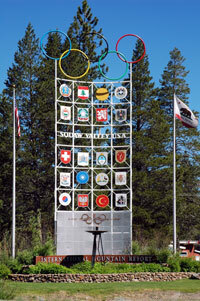 Take a trip back in time and learn about the 1960 Winter Olympics that took place at Squaw Valley USA. The Olympic Museum, located at High Camp showcases our unique collection of memorabilia, news articles, and video presentations detailing the many magical moments that took place at Squaw Valley USA. The museum is open daily at High Camp. Admission is free with your Cable Car ride. Roller skating is a fun and entertaining activity for all ages. The High Camp Roller Rink is best place to skate in the great outdoors! Accessed via Squaw Valley's Aerial Tram, the roller skating arena offers unmatched panoramic views of the Squaw Valley Meadow, beautiful Lake Tahoe and the surrounding Sierra Nevada mountain range. Squaw Valley's Swimming Lagoon and Spa is one of the most breathtaking places in the world to relax. Located at High Camp, el. 8200', the lagoon and spa are surrounded by the beauty of the Sierra's including views of Lake Tahoe. The free-form lagoon features 25 meter lap lanes and two islands landscaped with waterfalls and native boulders. The 25' diameter spa is heated to 102 degrees and surrounded by expansive decks and a casual umbrella bar. The Bath and Tennis Club provides lockers, showers, and changing rooms, along with towel rentals. Eat breakfast. Pack up and depart for home. You may cancel 60 or more days prior to the start date and receive a full refund. Cancellation 14-59 days prior to trip start date will receive 50% refund. 0-13 days prior to trip start date will not receive any refund.